One of the newest additions to the line, Harvest Shake is lighter, thinner, and easier to install, while maintaining the durability and weather-resistance rubber roofs are known for. It has the same outstanding limited lifetime and transferrable warranty, like the rest of the Euroshield line. If you want to replicate the look of individually split shake tiles, you’ll definitely want to consider this roof. Its 40-inch wide panels make installation fast and inexpensive. And, because it is made of the same recycled materials as all Euroshield roofs, any scrap left over at the end of your installation gets recycled right back into the manufacturing process for the next set of tiles. Choose certified professionals like Golden West Exteriors. If you don’t, you may end up with a roof that doesn’t meet warranty specifications. Only a certified roofer knows the ins-and-outs of rubber roof installation, whether you are re-roofing or putting a roof on your brand new home. 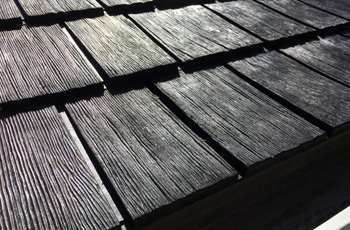 If the processes that are specific to the rubber-roof installation processes aren’t followed, you may end up with significant problems down the road. Call Give Golden West Exteriors in Edmonton today. We’ve been installing roofs in Alberta for more than ten years. We’ve built our successful business on our commitment to outstanding customer service, by always delivering highest level of craftsmanship, and by keeping our promise to stand behind our work 100 percent of the time. We are standing by to answer all of your questions. Schedule an in-home consultation and let’s discuss your project. We look forward to working with you.